The project allowed many levels of Millington to work together to raise awareness of the plight of some of our most vulnerable. Rosati’s Marketplace allowed members a space to take donations for the blue and silver pinwheels, the national symbol for the month of April. Kirby Co., All American Animal House, Quilted Hearts Quilting, McKatms, Millington Pizza, and Millington Church of the Nazarene allowed pinwheels in vases where those desiring could make a freewill donation and take a pinwheel to spread awareness. The club provided glass paint to Mrs. Dantinne’s Millington High School Art Class, who volunteered to draw blue pinwheels on the windows of most of the local businesses. Blue mesh wreaths were made with attached signs that read: “‘April Child Abuse Prevention Month’ sponsored by GFWC Millington Junior Women’s Club.” The wreaths were attached to light posts throughout downtown Millington for the month of April. One member submitted an article to the local paper explaining the project and reminding the readers that child abuse is not one month of the year, but daily for many children. 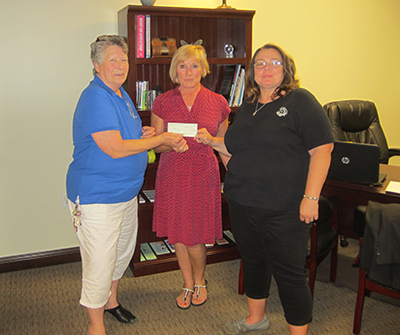 In June, members toured the CACTC offices and presented a $400.00 check to Kathleen Sweeney to continue the center’s work. The club wants to give a special thank you to the Millington Community for all their help making the “Color Me Blue” project a spectacular success and making this year the GFWC Millington Junior Women’s Club’s most meaningful in its 50 year history.